Gran Via de les Corts Catalanes, 619-621. 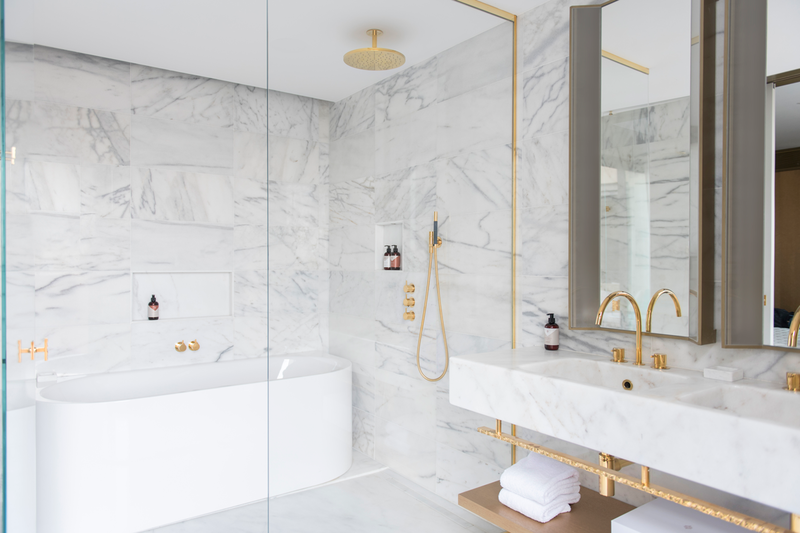 Almanac Hotels is destined to be a new luxury hospitality tastemaker recognized for developing iconic hotels in landmark locations that are rooted in rich histories. All of the properties are architecturally significant and located in the heart of each city where the cultural junction meets the urban landscape. This dynamic brand is inspired by locals yet determined to entice the wanderlust of travelers everywhere. 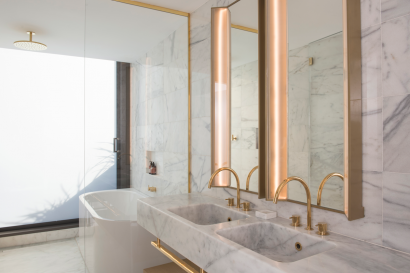 The Almanac Group wholly owns and operates each and every property in the current portfolio allowing them the freedom to develop and create visionary projects that are entirely bespoke in nature. 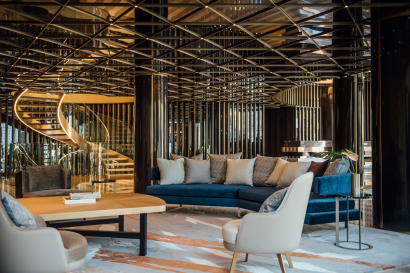 The commonality in each hotel is the delivery of exemplary luxury hospitality services – maintaining the highest standards across the entire brand – while respecting the individuality of each hotel and every guest. As a brand, Almanac Hotels understands and strives to enhance the elements of travel that make up your personal journey. Those components are comprised of Scent, Taste, Light, and Touch. When all of those things come together in an exciting way your heart may skip a Beat or it may beat faster – in either case you will know that we got it right. 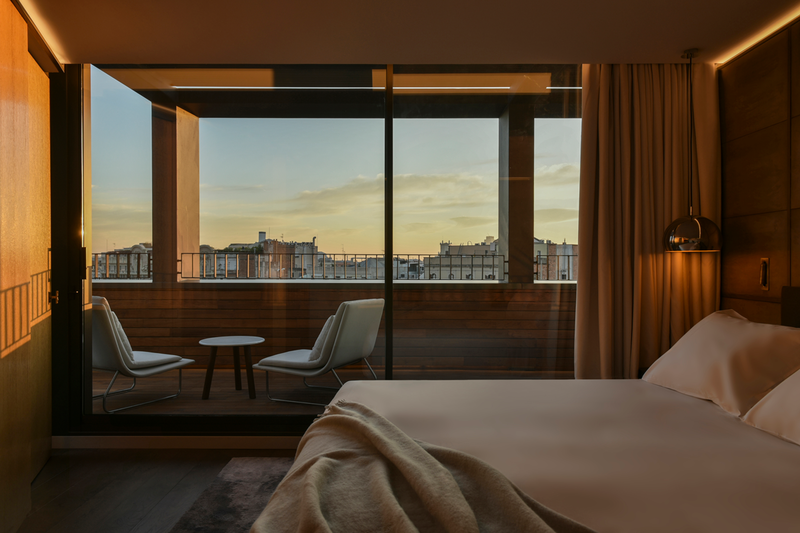 Awaken your senses to a new kind of hospitality experience and unlock the essence of Almanac Hotels. Almanac Hotels is a new hospitality tastemaker developing iconic hotels in landmark locations. The Almanac Group is creating visionary projects that are entirely bespoke in nature. This dynamic brand is inspired by locals yet determined to entice the wanderlust of travelers everywhere. All hotels are rich in history, architecturally significant and located in the heart of the city where the cultural junction meets the urban landscape. The commonality in each is the delivery of exemplary hospitality services – maintaining the highest standards across the entire brand – while respecting the individuality of each hotel and every guest. Awaken your senses to a new kind of hospitality experience and unlock the essence of Almanac Hotels. 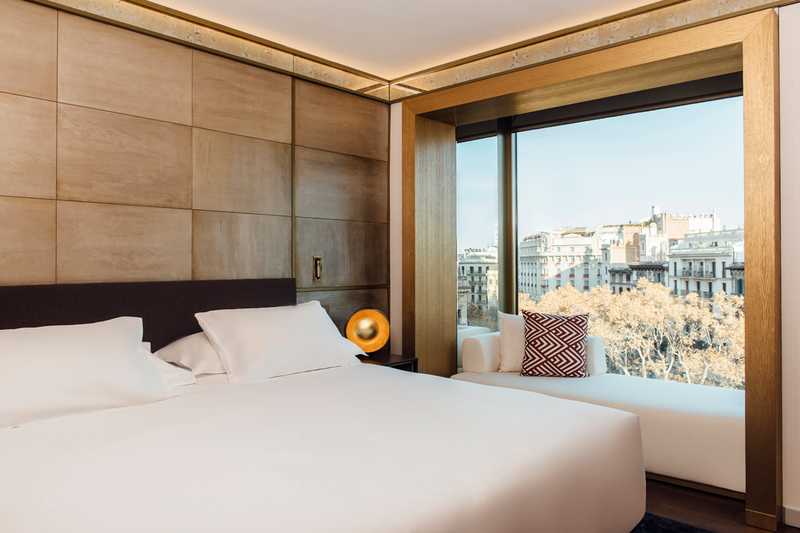 Located on Gran Via de les Corts Catalanes, 619-621, the hotel features 91 luxurious accommodations and has had a complete renovation over the last two years. 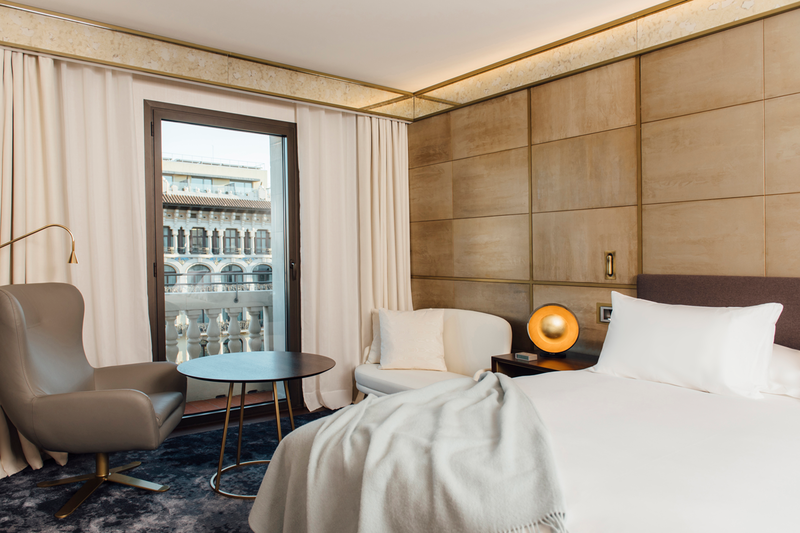 In a prime location, the hotel is steps from Paseo de Gracia, where guests can find stylish shopping, restaurants, bars and museums. Using a wealth of textures and materials, Jaime Beriestain Studio has created a feeling of discreet refinement throughout the hotel. A particularly unique feature in many of the rooms is a cubic window allowing natural light to flood into the interiors while incorporating a sofa into the windowed nook. Línia is the hotel’s Mediterranean brasserie offering an all-day dining and sharing menu where locals and traveler’s lives intersect from morning to night. The lounge and terrace at Azimuth welcomes everyone and serves an inventive cocktail menu transporting your taste buds on a journey around the globe. Standard size ranging from 30 – 34m2 • Suite size ranging up to 200 m² • Select rooms and suites feature balconies or terraces • Exceptional connecting rooms • Rooftop pool for residents with spacious sky-deck • Azimuth – Rooftop terrace and pool • Línia – chic Mediterranean restaurant with wine and cava bar/lounge. Eixample-city center. 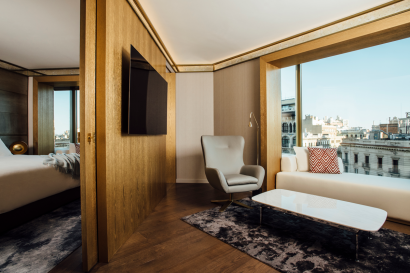 Located on Gran Via de les Corts Catalanes, 619-621, it is steps from Passeig de Gràcia, where guests can find stylish shopping, restaurants, bars and museums. • Steps from Plaça de Catalunya, considered to be both its city center and the place where the old city and the 19th century-built Example meet. Línia is the hotel’s Mediterranean restaurant offering an sharing menu where locals and traveler’s lives intersect from morning to night. Our skilled barmen will serve a select cocktail menu along with a choice of regional wines and the sherry of Jerez all in a relaxed atmosphere. 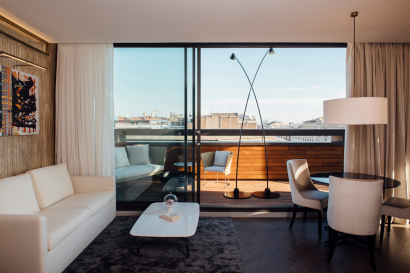 Guests can access the restaurant directly from Gran Via or through the hotel. Come and meet at the apex of Barcelona’s social life where the dedicated team will guide and transport you from day through to the course of a starry night. The captivating panoramic rooftop lounge and terrace, will serve an inventive cocktail menu to transport your taste buds on a journey around the globe. The glass enclosed lounge offers the opportunity to enjoy the views of Barcelona all year round during lunch and dinner for hotel guests and non-residents alike. Available exclusively, is perfect for special events, product launches or celebrations. 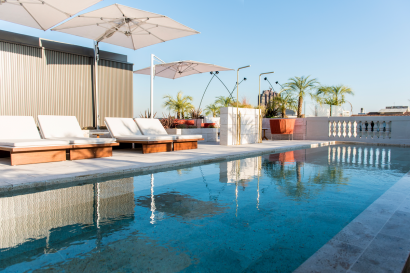 The rooftop lounge and terrace offers sweeping views of the city where you will always have the perfect backdrop for your photos – day or night. The rooftop wading pool and sun lounge are exclusive to hotel residents. 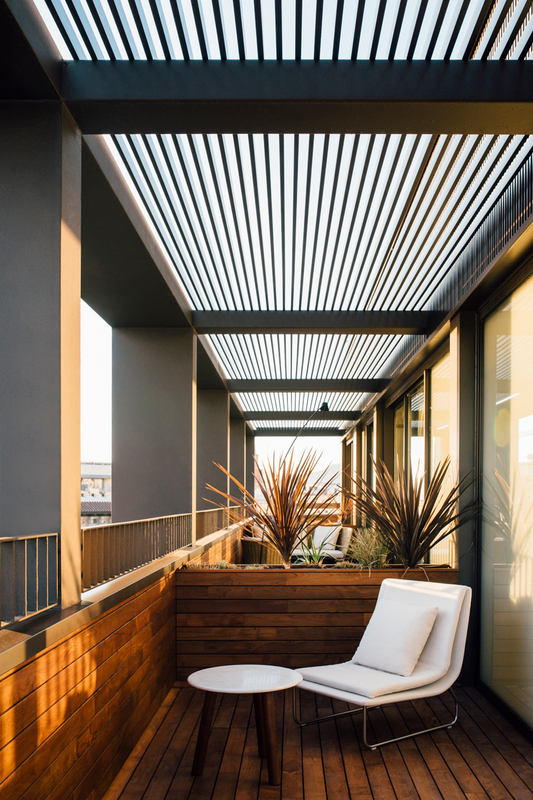 Boasting incomparable views of the city, it serves as a perfect place to relax, tuck into a corner, or read a book. Exclusive for hotel guests, enjoy a healthy moment in the sauna or steam room followed by a lay down on heated beds in the relaxation room. Reservations not required. State-of-the-art fitness facilities are open 24-hours for your convenience. Guests will find treadmills, elliptical and bicycle machines along with free weights that will help get your heart pumping. Personalized training programs with the finest coaches in the city are available through prior arrangements with our concierge. Anne Semonin offers pioneering skincare and tailor-made body treatments. Pamper yourself through the touch of the soothing hands of our wellbeing professionals. For added privacy, treatments may be provided in your room or suite. Learn more about our menu of services or book now to make a reservation. 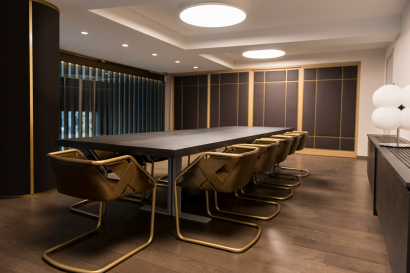 The various meeting rooms are all enhanced with the latest technology required for today’s business leaders including the finest sound systems and video conferencing capabilities. Located on the mezzanine, with views of the lobby, the Light Meeting Room seats up to 14 guests. Its elegant board table makes it the perfect place for an executive meeting. The room provides state-of-the-art technology, including AV equipment and Wi-Fi access. Taste & Scent rooms are located on the mezzanine and benefit from ample natural light during the day yet can be subtly shielded from the outside world. Designed in grey, beige and gold tones, each room has a single table for up 10 guests and a plasma screen. The rooms lend themselves equally well to presentations, celebratory occasions and small events. 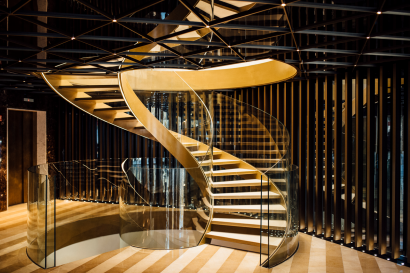 • Beat & Touch rooms are approached down a sweeping, curved staircase from the lobby. Their flexible seating make them particularly suited to presentations, fashion and meeting events, receptions and seated lunches & dinners. State-of-the-art technology, including AV equipment and Wi-Fi access. Located on the rooftop, Azimuth enjoys spectacular views of the city which will allow your guests to experience the energy of Barcelona. The lounge and terrace are the perfect setting for receptions, gatherings and dynamic meetings. These venues can be reserved exclusively for your event.